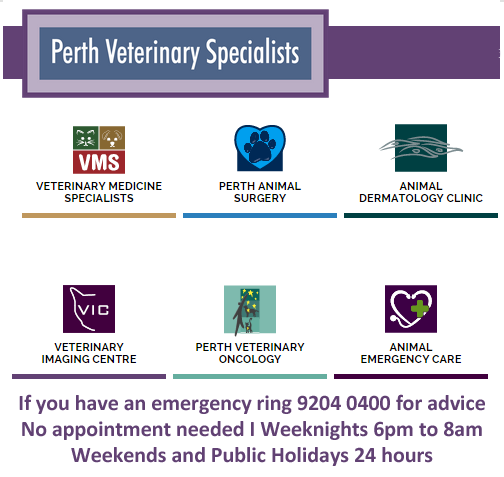 Perth Veterinary Specialists is open 6 days a week with Oncology, Internal Medicine, Radiology, Surgery and Dermatology departments. All these departments are headed by specialists and easily accessed by referral from your local veterinarian. When an animal is hurt or develops a severe illness, there is often a need for specialised expertise and equipment to properly diagnose the problem and guide appropriate treatment options to achieve the best possible outcome. The specialist veterinarians at Perth Veterinary Specialists form close partnerships with both the pet owner and the referring veterinarian in order to accomplish these goals. Perth Veterinary Specialists is a multidisciplinary referral specialist centre based on the premise of best possible veterinary care for pets. The purpose designed premises offer full diagnostic capabilities including an in-house laboratory and state of the art diagnostic imaging and surgical facilities. Trained and qualified staff provide compassionate supportive care through every stage of your pet's illness, allowing peace of mind that your pet is in the best possible hands. An emergency practice operates after hours at this site. The veterinarians in this practice that care for your pet are general practitioners experienced at dealing with the majority of problems that occur out of hours. Specialists may be called on to advise, consult or perform procedures out of hours when required. To access the after-hours emergency department no appointment is necessary, though if possible please call to let us know you are on your way.